Coffee is something that refreshes everyone and helps us to stick to our daily schedule. Whether sipping on your coffee to give a good start to your day or rejuvenating yourself during a harsh day at the office with a cup of hot coffee, it never fails to refresh your mood. However, it becomes very hard to get your much-needed cup of coffee while travelling. Be it a camping trip or a trip abroad, you may not always get the chance to buy a cup of coffee. So, what will you do then? 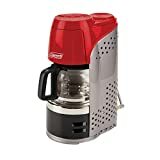 Well, there is one thing you can do; you can buy yourself a portable coffee maker which will provide you with your supply of nice hot coffee anytime you want. Though it is true that the portable coffee makers are not as extravagant as the classical Italian coffee makers, they are still highly efficient, nifty and have great quality. But it is not practically easy to buy a portable coffee maker these days since there are so many available in the market. You need to be absolutely sure about the features, durability of the product and several other things. An exquisite portable coffee maker, the Coleman QukiPot really serves you with a cup of freshly brewed coffee whenever you want. With 4500 BTUs of cooking power, it serves you with freshly brewed coffee in just 18 minutes even under extreme conditions. Hence, there is nothing you need to worry about since you will be able to relish your coffee anytime and anywhere you want. Moreover, it comes with ‘pause and serve’ feature which allows you to fill a cup while brewing. The coffee maker also offers 10-glass carafe which holds enough coffee for your entire family to enjoy. Above all, the removable fill basket is easy to clean and it is dishwasher-safe. Coming with a 3-year warranty and the assurance to run 4.5 hours on 16.4Oz propane cylinder, the Coleman QuikPot is definitely a fine choice. So, if you are planning a family trip, then make sure to pack it as well. The most exciting thing about this portable coffee maker is perhaps its design and build-up. Having a magnificent stainless steel interior along with double-walled insulation, this French Press Coffee Maker from Ohuhu keeps the coffee warm for a long time. On the other hand, the extravagant wine red exterior is cool to touch and offers an elegant look to this coffee maker. 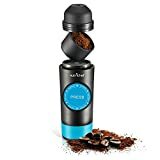 The coffee maker comes with a specially designed PP plunger which helps to keep the coffee on the upper side while ensuring that the sediments remain at the bottom. Furthermore, you will not have to worry about getting coffee grinds in the brew. The specially designed stainless steel mesh along with the spiral spring keeps the grinds away from your brew effectively. Above all, this coffee maker is very easy to clean and it is much easier to carry it around in a pouch since it is very light in weight. 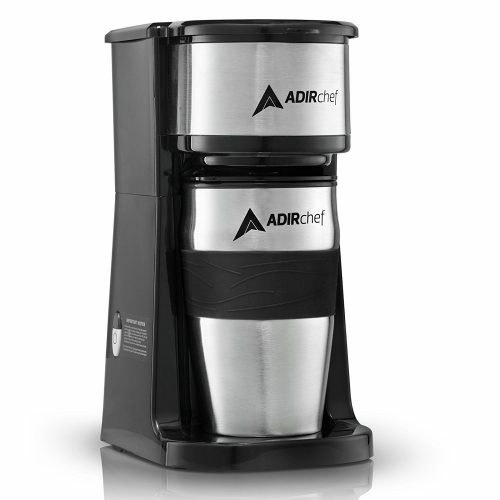 A truly eco-friendly portable coffee maker, this excellent product from AdirChef uses a permanent filter. Thus, it eliminates the need for changing the filter papers over and over which in turn serves a greater purpose of protecting the trees. Having a perfect size, the travel mug that comes with this coffee maker fits almost all cup holders as well as drink vessels. The mug is ideal for everyone who likes to get a takeaway for their coffee while hurrying for the workplace. 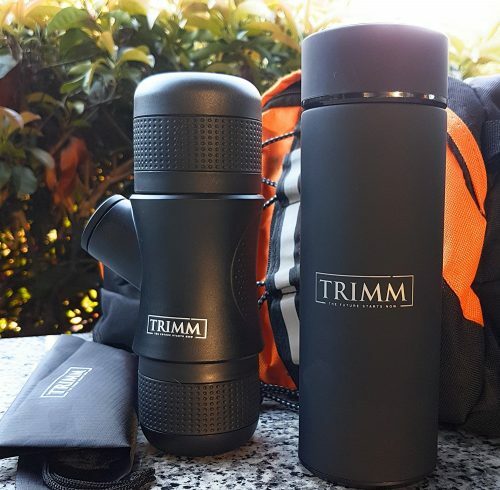 Being insulated heavily, the cup ensures to keep your coffee warm for a long period of time. However, the best thing about this coffee maker is perhaps its construction. Constructed from lightweight and high-quality plastic, this AdirChef coffee maker guarantees you about its durability. Furthermore, the mug just weighs 15 ounces; so you will not have any trouble in carrying it with you too. This coffee maker consumes very little space; as a result, it is suitable for camps or tiny cubicles. It is also very easy to use. Just set the coffee maker and plug it to get a cup of freshly brewed coffee. Also, it is fully dishwasher-safe; hence, you will never have to worry about anything. The KOHIPRESS portable coffee maker is a versatile item that you can possess. It not only serves as a coffee maker but also acts as a mug to help you savour your coffee at the same time. Actually, the coffee maker uses a highly pressurised plunger press to provide you with a serving of smooth and rich coffee. It is very efficient and environment-friendly too. 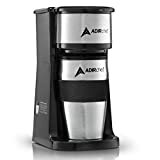 This coffee maker uses a reusable stainless steel mesh filter which can be easily removed, cleaned and reused without any trouble. As a result, it saves a lot of money apart from being eco-friendly. Equipped with leak-proof lid and weighing just 13 Oz, the coffee maker is also very easy to carry around. Furthermore, the patented mechanism of self-locking that the KOHIPRESS Coffee Maker uses ensures that the used coffee grinds remain separated such that it can be easily cleaned. Having a high-quality stainless steel interior and double wall vacuum insulation, this French Press Coffee Maker keeps the water warm for a very long time. The VDS portable mini espresso maker is really a fine portable coffee maker that you can have. 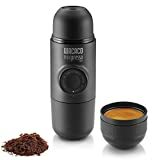 This handheld coffee maker comes with a portable coffee grinder which helps you to get a perfectly ground rich coffee anytime you want. It is one of the most easy-to-use handheld coffee makers available. With just 8 Oz pressure, you will be able to have your freshly brewed cup of rich and energising coffee. Furthermore, this espresso maker is hand-operated thus no electricity or battery is needed and it is very easy to clean. Just rinse under a tap to get it cleaned. Plus, you get four additional colourful silicon pieces absolutely free. 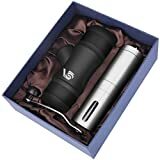 With 12 months manufacturing warranty and 30 days money back guarantee, this VDS portable mini espresso maker serves as a perfect gift for special occasions. 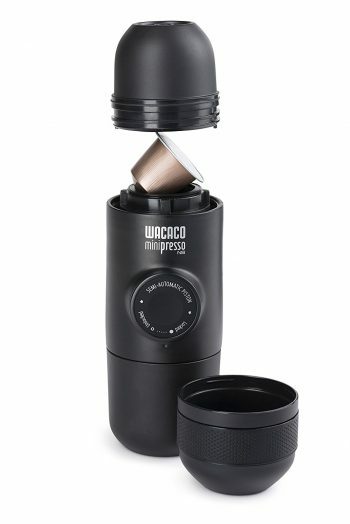 Here is another great mini espresso and coffee maker from WACACO. 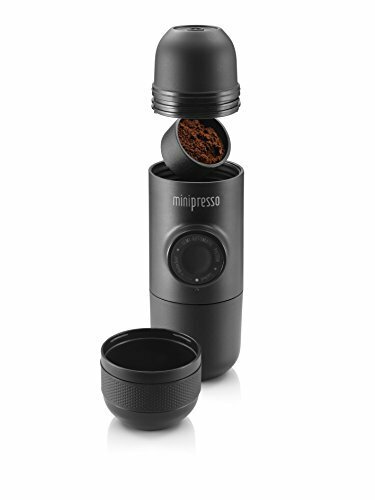 This small, handheld as well as versatile espresso maker boasts a pioneering design along with formidable extracting pressure to provide you with the perfect cup of rich espresso. Most importantly, it comes with an inbuilt espresso cup as well as scoop which make it much more user-friendly. 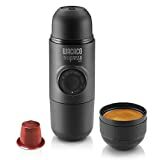 You will be able to determine the perfect taste, texture and richness with this espresso maker since it allows you to grind the coffee beans in order to help you enjoy a sophisticated espresso shot. With its efficient semi-automatic piston, this coffee maker is very easy to use. Plus, it is completely hand operated, thus you will be able to have your coffee even if there is no electricity. Perhaps the best thing about this mini portable coffee maker from Pamapic is that it allows you to bring your coffee wherever you go. If you have this coffee maker, then you will be able to enjoy your coffee without having to do almost anything. It works automatically and you do not need to grind your coffee yourself. Compatible with almost every K cup, this coffee maker is much more convenient to use. Also, all parts of this coffee maker are easily detachable. Hence, you will never have to worry about cleaning it while travelling. Apart from being small as well as lightweight, it is also certified by European Union ROHS standards. Well, it seems like WACACO coffee makers have really special place in the market. Like its predecessor on the list, the WACACO NS is a perfect companion for travelling. It does not require any electricity; thus you will be able to use it anywhere you want. All you have to do is to add some hot water along with a Nespresso capsule and hand pump to get your perfect cup of rich espresso. It is more convenient, portable and very easy to clean. Further, it uses Food Grade Plastic and is absolutely free of BPA. The coffee maker does not need any electricity or battery to function as it is hand-powered. 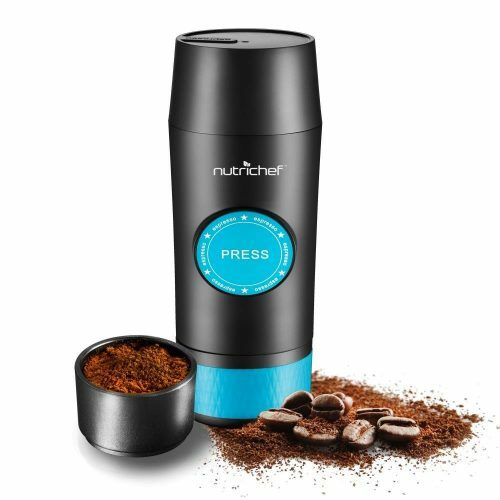 The Nutrichef portable coffee maker is really one of the best ones out there. It takes just 30 seconds to serve you a cup of brewed coffee. Built with high quality, food grade and non-toxic materials, this coffee maker promises to be an exciting addition to your household. Being fully automatic, the coffee maker comes with an USB power cord; so that you can easily connect it while travelling to meet your requirements of caffeine. This machine does not require any special maintenance. It is lightweight, stain-resistant and very easy to clean. This one right here is obviously the most efficient and exhilarant portable coffee maker that you can possibly own. It offers you with a freshly brewed cup of coffee instantly within a few seconds. It is completely hand operated; thus you will be able to use it anywhere you want without having to worry about the availability of electricity. Plus, this coffee maker has a very compact design, lightweight and it is very easy to be carried around. Being made of stainless steel, it has a removable strainer and even a detachable cup. And the best thing is that it makes not only coffee but also tea. Also, it is not at all complicated to use and you can clean it anytime you want without any fuss. 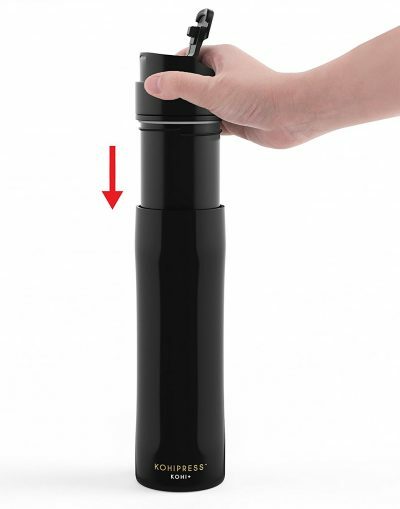 So, bring home this portable coffee maker and enjoy your espresso shots without any trouble. These portable coffee makers have been a boon to for every caffeine lover. Now stay caffeinated at anytime, anywhere!